Brothers William, David, James and George Quigley. James died at the Somme while a year later George drowned in the Foyle. Tom Hamilton 2017 with the copybook that belonged to George Quigley. Inset depicts the death penny awarded to the family of soldier James Quigley. A children's copy book is the last link to a tragedy that stunned a Donegal village and devastated four families. The book belonged to George Quigley - 13 - from St Johnston and is dated 1913/14 when George was ten. Three years later George S Quigley as he signed the cover was dead. Marina Hamilton, Tom's daughter, stumbled across the copy book in April this year. Two of the boys that drowned has lost brothers in the First World War at the Somme. They too died side by side. In the space of 12 months, the Quigley and Dowds families lost two children each. Tom Hamilton says, "It was a terrible time for the families. I knew the Quigley family well and they often talked about losing the two boys. I have the death penny which was sent to the family after James died but they were so heartbroken they couldn't take it out of the case. Then within a year the two families were burying two other sons. More than forty young men from around St Johnston died in the First and Second World Wars. The Quigleys who used to own the shop in St Johnston have mostly died out or left the area. There is no one left. There was no one even to put up a headstone. It is sad when you read George's copy which is all about plants and you see how clever he was. Little did he know then he would be dead in three years and so would his older brother." Local tradition says James Burnside was from the North. He would have been related to the McGirrs who lived where the forecourt is now in St Johnston. Mary Jane had a family in Belfast and in her confusion in her later years looked for them by candlelight at the time Ard Baithin was being built in the 1950s. Her sister Maggie retired and lived with her. Robert John McGirr their brother worked on the Titanic. Carrie McGirr? married Lecky and lived near where Craigavon Bridge is now in Derry. Meeting: There was a Memorial Meeting at St Johnston and Carrigans Family Resource Centre recently to work out how to mark the memory those who have tragically lost their lives on the St Johnston stretch of the Foyle. On the 30th June this year it is the 100 year anniversary of four boys from St Johnston who tragically drowned while bathing in the Foyle at a place locally known as the Widgeon Hole. They drowned on Saturday 30 June 1917. 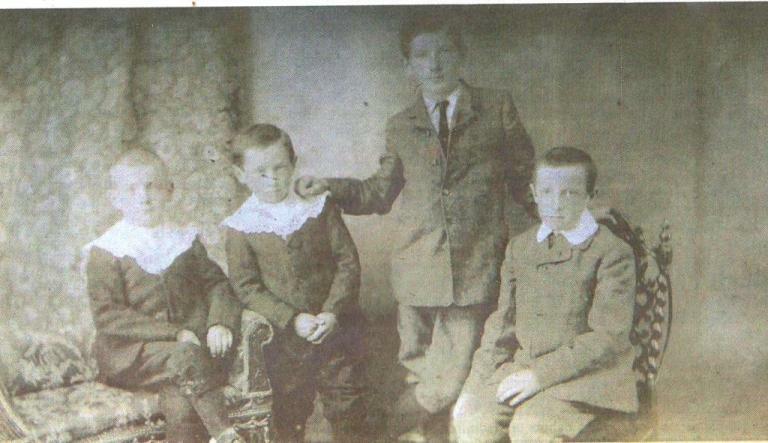 The boys were Arthur James Dowds (aged 9), James Orr (aged 13), George Quigley (aged 13) and Patrick O’Donnell (aged 9). A fifth boy, James Burnside (aged 14), survived after turning back after realising the water was too deep. The tragedy fell heavy into the hearts of the whole community. The inquest that was held in St Johnston at the time by Mr Edward Gallagher, coroner for East Donegal. Witnesses said that on Saturday 30th June 1917 about noon the boys all went to the river to bathe. They first went to where a boat man named James Lynch was tarring his boat. They had intended to go bathing there but there was not sufficient water there so moved to the channel where the tragedy then happened. A public meeting took place on Tuesday 25th April at the Resource Centre to discuss a fitting remembrance for the tragedy which happened one 100 years ago and to those who have lost their lives since. It was proposed to get feedback from the local community on what they would feel would be a suitable memorial and the possibility of a remembrance service near the shore. Centenary: The 100 years Drowning Tragedy Memorial Service on 30th of June will mark the 100 year anniversary of the tragic drowning of four local boys. The community has come together to organise a memorial service and tree planting ceremony on that date. The service is to remember these boys and others who have lost their lives in the river. The service will be held at the St Johnston cricket pitch and tea will be served afterwards in St Johnston and Carrigans Family Resource Centre. This event is open to all and the clergy from the four local churches will lead the prayers. The service will begin at 6.30pm. A border village is planning a permanent memorial to mark the centenary of a drowning tragedy in the River Foyle in 1917 in which four children died. Arthur James Dowds (9) and James Orr (9) along with their 13-year-old friends, George Quigley and Patrick O'Donnell drowned when they got into difficulty while enjoying a summer swim on June 30, 1917. The four children were swimming near a pool in the river known as “The Widgeon's Hole” when disaster struck. All four were from the village of St Johnston, just seven miles from Derry. Little is known about the victims other than that Arthur Dowds father, Thomas was principal of the local school. The family suffered another tragedy a year earlier when Arthur's brother was killed on the first day of the Battle of the Somme. Historian Stephen Hunter, who is researching the tragedy on behalf of the Carrigans and St Johnston Resource Centre, said the drownings became deeply embedded in the psyche of the local area. He said a recent public meeting to discuss ways of marking the centenary was well attended and particularly emotional. “We'd people from all over but what made it more poignant was the attendance of some people who lost a child in the Foyle in recent years,” he said. A fifth friend at the time, James Burnside (14) realised that the water was too deep and survived the tragedy. He told an inquest into their deaths that the five friends decided to go for a swim around noon on Saturday June 30 1917. On their way they passed local man, James Lynch who was “tarring” his boat. Burnside recalled that James Orr suggested the group move out into the deeper channel of the river. He recalled the horror as he watched his friends get into difficulty. Later that night a diver brought in from Derry recovered the bodies of Dowds and Orr. Patrick O'Donnell and George Quigley's remains were not found until later. The Donegal-based historian said organisers were keen to speak to anyone who could shed more light on the tragedy.